Graham Hardie takes particular note of the wide range of the poems in a debut pamphlet by Robin Thomas. 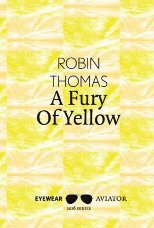 Robin Thomas’s A Fury of Yellow is a wide-ranging and enjoyable pamphlet. It features a variety of moods from light to dark; there are references to high culture, it includes the occasional family reminiscence and sometimes a prose poem. There is also a slightly sardonic wit about some of the pieces. “Unopposed” deals with an army invasion which meets little or no resistance. It tersely reports “the tank engines clatter into life.” and “seated on the tanks, their legs dangling, are soldiers” and, eventually mentions “the clean up squads, taking what is moveable or edible.” This is a prose poem and is effective in painting its picture due to its well chosen language and the abruptness of its style which reinforces the brutality of the invasion. Other poems also demonstrate the poet’s obvious creative talent. “Excursion” includes a picturesque image: “The river is leaf-painted emerald.” “Bright Yarn” describes encounters with Great Aunt Edith who is “propped up knitting socks for me.” The meetings take place “where duty would take us weekly to sit / in her dim, tiny room piled up with the smell of sickness” – an atmospheric accumulation of authentically depressing elements. as all men take leave of their mothers. – lines which I greatly admire for sheer impact and a state of awe expressed so simply and so acutely. A Fury of Yellow is quite unusual in the sense that it fuses many elements into one short space: pathos; wit; dexterous use of simile and metaphor; a heightened imagination; an ability to make poetry from the commonplace. It offers fresh insight into the cycle of life and death, sometimes setting it in the context of the Christian tradition. One criticism might be that a few of the poems seem to me to be noticeably less accessible than the rest; but this is not to detract significantly from the overall accomplishment in this debut pamphlet by a talented poet.